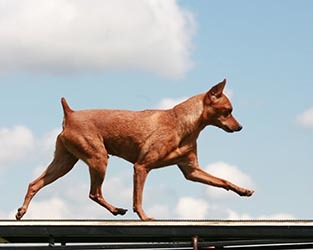 Noelle's instructors have included Patty LeRoy who has record setting Miniature Pinschers, plus Janet and Michelle Ooms and Linda Caughlin. We have enjoyed these amazing ladies for their wisdom and sense of humour. Currently we are training with Sookie and Lynda Bowers at Benalto. Noelle RN RA RE NAC O-NAC TG-N O-TG-N NJC O-NJC HP-N is my demo dog and enjoys entertaining the masses. Classes for recreational agility run every 6 weeks. For competitive classes we recommend that you contact Calgary Canine Centre in Calgary and Fhionavar Training in Olds and Lynda Bowors in Benalto.